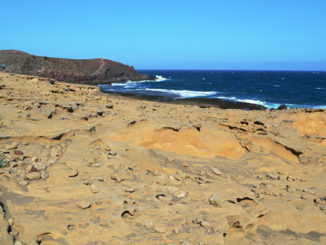 The La Paz area of Puerto de la Cruz is often dismissed as being ‘touristy’. And it is. 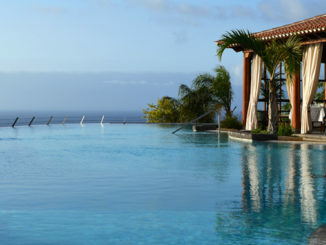 On the surface most of it has the look and feel of a purpose-built tourist development. Although it was the closest area of Puerto de la Cruz to us, for a long time we more or less ignored it, passing quickly through on our way to the ‘real’ town. But every so often something interesting would catch our eye, perk our interest. Once we really got to know it we realised there was quite a bit more to the area which sits on the cliffs looking down on the centre of Puerto de la Cruz. 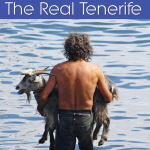 For a start, some of Tenerife’s original inhabitants, the Guanche, lived in the cliffs La Paz is perched upon – Los Acantilados, Ladera y Cuevas de Martiánez. The narrow, and steep, lane which links La Paz with the lower town is called the Camino de las Cabras, the route livestock farmers once used to move their goats from the cliffs to sea level. 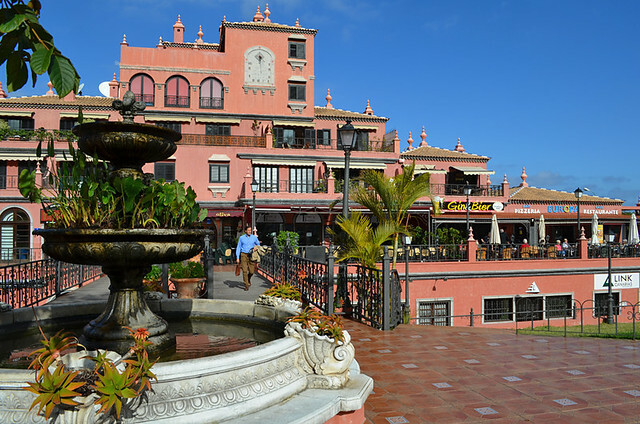 Following the conquest of the island the lower Orotava Valley was prime land, beautiful and fertile, attracting noble interest. The tiny Ermita de San Amaro opposite the Mirador de la Paz dates back to 1591, making it the oldest religious building in Puerto de la Cruz. Along the same street is Casa Cólogan, a lovely colonial mansion built in the 18th century by the family of one of the most interesting and influential figures in Spanish political history, Bernardo Cólogan. There were many Irish settlers on Tenerife who played important roles in the development of the island, the Cólogans were one such family. Casa Cólogan made such an impact on Agatha Christie she included it in her short story The Man From the Sea which was based on La Paz. 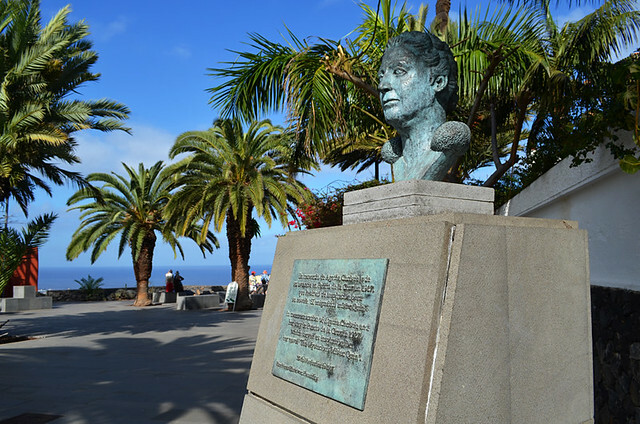 To commemorate this, there is a bust of the famous crime writer at Mirador de la Paz which many ignore in their haste to get to the viewpoint over Martiánez and the town. 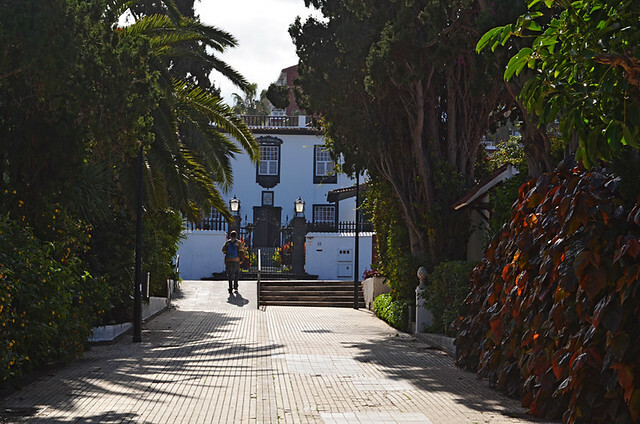 The most obvious historic landmark in La Paz is obviously the Botanical Gardens, or the Jardín de Aclimatación de la Orotava to give it its proper title. Commissioned in 1788 by Carlos III the garden was created as a halfway house for plants from the tropics en route to mainland Spain. The area was chosen because of its ideal climate. 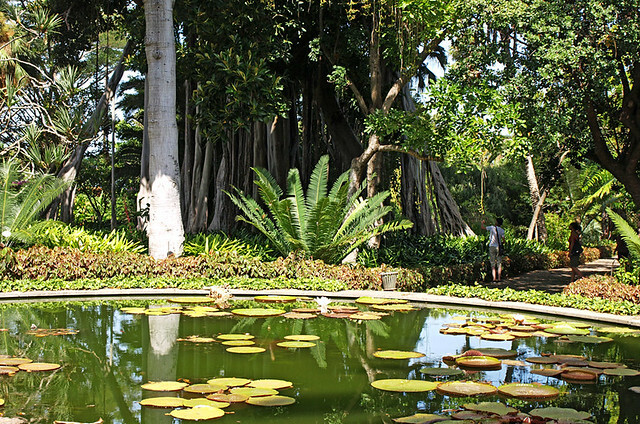 Unfortunately for mainland Spain and fortunately for Tenerife, many plants far preferred the Canary Island climate and the Jardín de Aclimatación de la Orotava became a permanent home, remaining the best botanical gardens in the archipelago. Ah, but the bar and restaurant scene in La Paz is definitely aimed at tourists, especially German ones. Once again, to define La Paz in this manner is to only look at it on a superficial level. It is an area which is popular with German visitors and as a result there are a couple of German bars. Cerveceria City is a good football-watching bar with a range of ‘proper’ beers whilst Pepito, where you can get currywurst, is in a great people-watching spot. On the clifftop walkway you can even find a restaurant which serves flammkuchen, a tasty German take on pizza which I recommend trying. Also, on the main road into Puerto is Tirorer-alm whose name is a giveaway about what you’ll find on the menu – hearty Austrian fare. However, most restaurants in La Paz aren’t aimed at just German/Austrian visitors. It’s a good area for Italian food – Tressardi, Zebra and Da Arianna all serve good pizzas, and Da Arianna, great for pasta dishes as well, is regularly packed out with well to do Canarios. 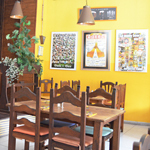 Just around the corner, opposite the Botanic Gardens, Europa also has pretty good pizzas as well as Canarian cuisine and is also a popular venue with both Canarian locals, non-Canarian locals and visitors. There’s no shortage of good Canarian restaurants. 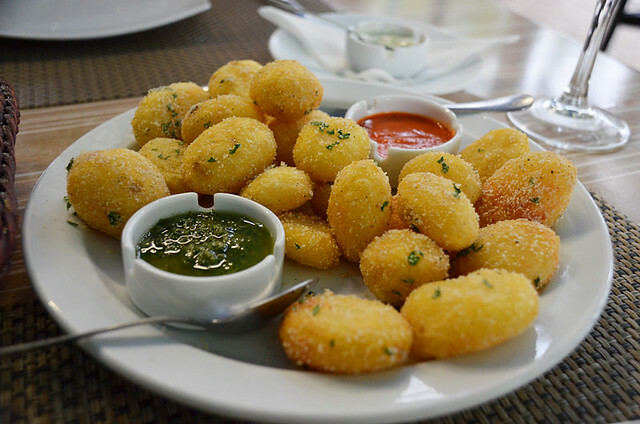 Our first choice if we wanted something more than tapas but not a full blown meal would be Bodeguita Algarrobo whose papas algarrobo (pictured above) are worth visiting for alone. For a tapas lunch we’d take friends to Meme which has a menu featuring most tapas classics. It’s also a vinoteca, so good for vino lovers. 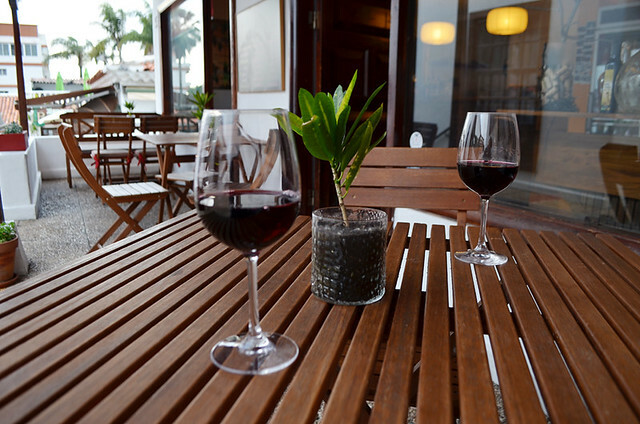 Even better is La Vinoteca, a tiny mix of wine bar, tapas bar and off licence where you’ll find local wines from small producers as well as from the better known Tenerife bodegas. 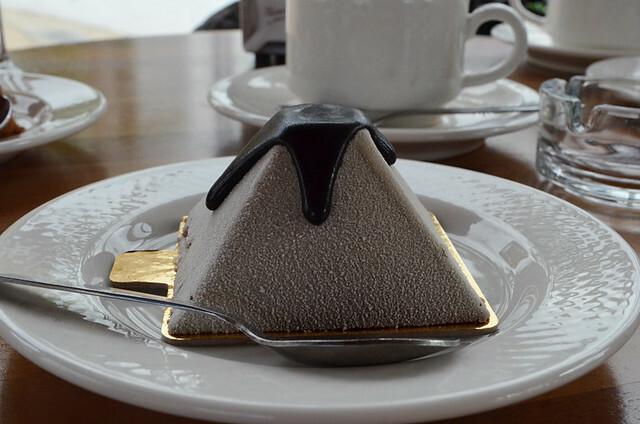 For coffee and cake lovers, famous Tenerife cake and chocolate makers El Aderno have a café/shop beside the main road in the Canary Centre, a pleasant low rise and low key shopping centre with some decent little independent shops, cafés and restaurants. After dark there are a few places for a drink and cocktail. Cafe Alba on the clifftop is ideally placed for a golden sunset drink whilst La Cla Terraza y Mas is a good chill out cocktail bar which sometimes has live music. Late owls also have La Habanera which doesn’t open till 10.30pm and live music club El Arcón which doesn’t open till 11pm on Friday and Saturday. Both are populated mainly by locals and probably rarely get a mention from tourists because many might be tucked up in their hotels by the time they open. 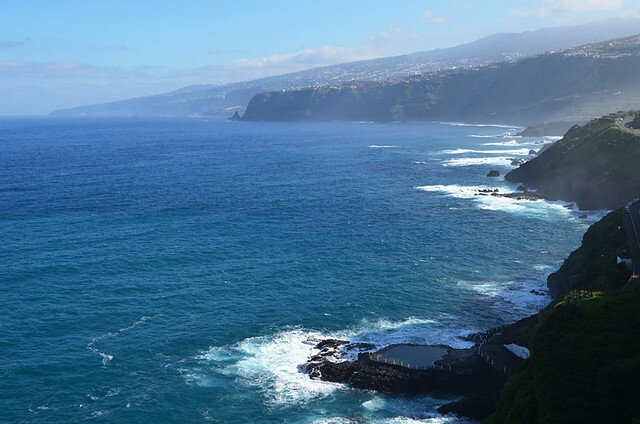 Another thing La Paz has going for it is it’s at the northern limits of Puerto de la Cruz, with the rugged coastline beyond the town providing dramatic views as well as leading to some of the best black sand beaches on Tenerife. There are a few other quite fascinating things about La Paz, but we like to keep some things to ourselves and, anyway, it’s always more satisfying when you discover new things for yourself… if you delve deep enough below the tourist development facade. Fabulous article Jack. Never judge a book by it’s cover. La Paz has all the history. Did you know that the DNA of the original Guanche people only survived in the females? Thanks so much to you and Andy. Amazing reading. Moving from Glasgow to Puerto will be the biggest challenge of my life. I didn’t know that about the Guanche Kevin, fascinating. Thanks. As for moving to Puerto, we felt the same; a complete step into the unknown. In retrospect we were incredibly naive. If you asked me would I do the same again the answer would be without a second’s hesitation. Fantastic place.